Get ready to climb lots of steps and go off the beaten path on this challenging 5-mile walking tour of San Francisco’s Telegraph Hill, Russian Hill and North Beach neighborhoods. Ascend the Filbert Steps for a close-up view of lovely Coit Tower. 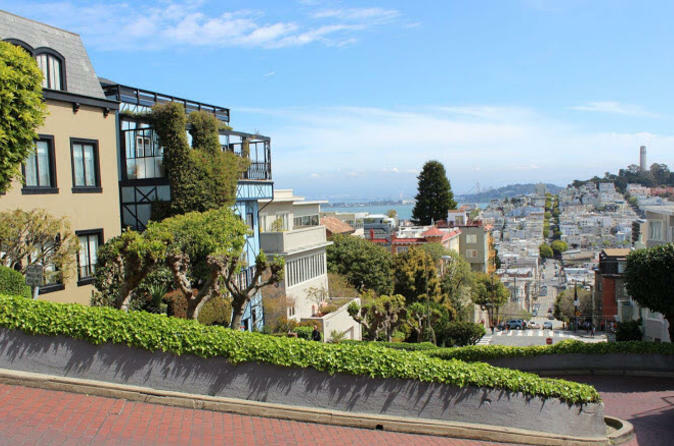 Walk up the world-famous crooked section of Lombard Street and discover hidden gems like a tiny park with an amazing view of Alcatraz and the church where Marilyn Monroe and Joe DiMaggio had their wedding photos taken. Put on your walking shoes and meet your guide at Levi's Plaza Park to begin your 3-hour adventure. Your guide will get your heart pumping right away with a climb up the Filbert Steps, which run along Telegraph Hill. Pause along the way to capture photos of the panoramic views, and keep your eyes open for the wild parrots who call this hill home. Then, go where few tours can, as you ascend to the top of Telegraph Hill to admire Coit Tower, the 210-foot (64-meter) art deco tower, one of San Francisco’s best-known landmarks. From this vantage point, take in a commanding view of San Francisco, Alcatraz, the Golden Gate and Bay Bridges, Pier 39 and more. Continue on to Jack Early Park, a very tiny lookout at the top of a hidden staircase, and take in views of Alcatraz and Pier 39. Next, it’s time to visit the Russian Hill neighborhood and walk up the famous curvy section of Lombard Street that is commonly referred to as the world’s crookedest street. Throughout your tour, your knowledgeable guide will share facts about the sights you see and historical anecdotes. You’ll also see some pop culture landmarks, such as Macondray Lane, which was the inspiration for Barbary Lane in Armistead Maupin’s Tales of the City novels, and Saints Peter and Paul Church, where Marilyn Monroe and Joe DiMaggio had their wedding photos taken. Soak up the atmosphere of North Beach, San Francisco’s Italian neighborhood, before ending your 5-mile urban hike by descending the Greenwich Steps back to your starting point.